PRODUCT: ASI # 701025, 2-inch Conduit Pipe Flashing / Rain / Storm Collar. 1.6 inch ID fits 1-1/4 inch NOMIMAL size pipes. 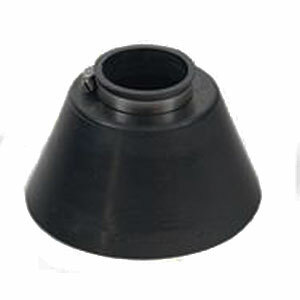 Base is 5 wide x 3.3 inches high heavy-Duty 0.24 inch thick Black EPDM. Includes Stainless Steel Pipe Clamp. Price/Each. 5 inches diameter at the base x 3 inches high. Install easily in a few minutes. Slip pipe through flashing collar. AC and other roof top units. Retro-Spin® Flashing BASE. Constructed of two interlocking galvanized metal components which fit up to a 3 inch OD size. (Use together with EPDM Retro Storm Collar / Retro-Collar top pieces). Price/Each.